Café Lalibella is a treasure of the Phoenix Metro Valley. Located on Hardy and University at 849 West University Dr. Tempe, AZ 85281, it is easily my favorite restaurant. Though it is a 45 minute drive for us, Jason and I go at least once a month to eat delicious Ethiopian delicacies. We always order a #17 platter with two orders of shiro wat. Even thinking about their shiro wat makes my eyes roll up in my head a little. But, Café Lalibella and I did not always have this relationship. Jason first took me there within our first month of dating. He beamed as the platter was set down, and proded me to try this new cuisine. 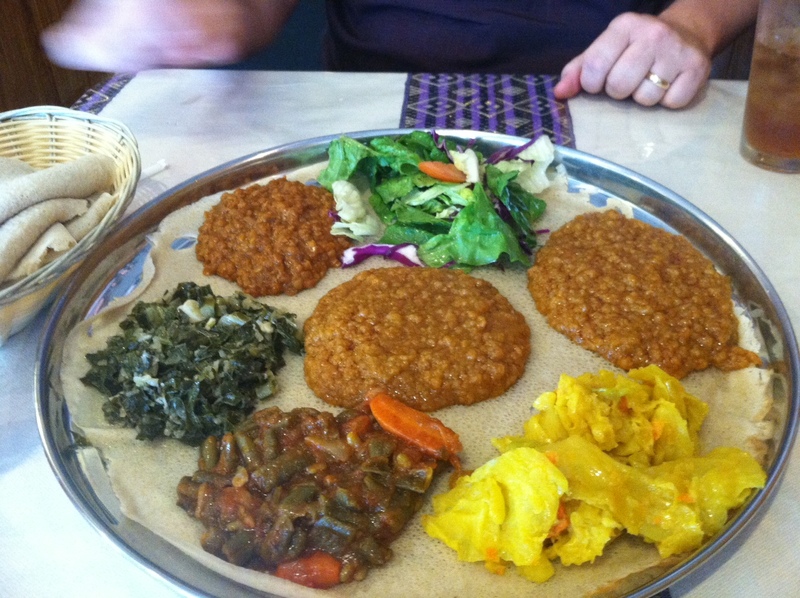 I had been vegan for a while, but this was my first Ethiopian food. I was excited to try it (and to be on a date with this beautiful man I was already in love with), but I was sick to my stomach. Due to the stress of a failing friendship with my best friend of years, the decision of leaving graduate school, and trying to split my time between Flagstaff and the valley, my ulcers were tap dancing. I took a few bites of food, and decided that I was close to it leaving my body. I picked at it so I didn’t have to let on how I felt and realized I hated Ethiopian food. But, I never told Jason. A few months later, he wanted to go back. By now, I knew I loved him. I could pick at food I didn’t like for my fiancé. However, when I started picking, a weird thing happened. I wolfed it down. I liked it a lot better this time. The next time, I ate even more and fell in love with the food, culture, smells, and sounds of the little Tempe restaurant. More often than I care for, I have students in my cooking classes tell me that they tried being vegan for a week and didn’t like it, so they’re going to keep eating meat. Because of where I work, I smile and nod, and tell them they need to make their own choices, because they do. At the same time, I think having an open heart, and open mind and trying things more than once is key. When you’re giving up meat, eggs, dairy, and fish, it can be scary. You get a plate of beans that might be bland because you don’t know how to prepare them yet and you might just decide you don’t like being vegan. Go back. Love yourself and your family enough to keep picking at that food, and soon, you’ll fall in love.